Gorgeous tasting ice cream with either a ripple of sauce all the way round it or the flavour blend which has the sauce blended through the ice cream. Slightly confused? Come and have a try, just like Haribo, kids and grownups love them so! Towards the top end of our site you will find our food court area. 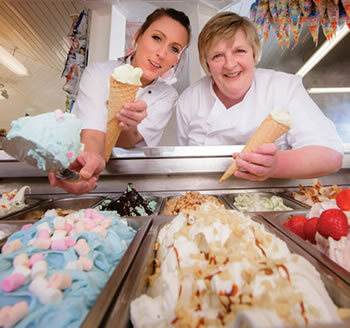 The recently refurbished Beach retreat cafe is the home to our handmade Gelato ice cream. What Willy Wonka was to chocolate we are to Gelato! Our little Umpa Lumpas beaver away creating over 25 flavours daily in the peak season, sorry no golden tickets hidden in our products though!!! 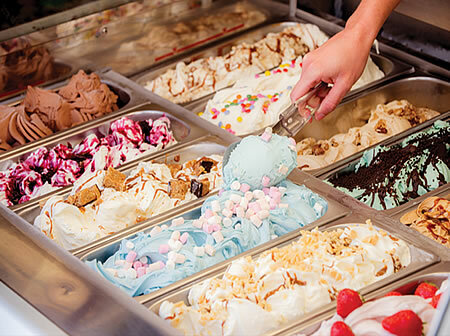 We are the home of the famous Flavour burst and flavour blend Ice cream. Basically these are bringing the whippy ice cream out of the dark ages and into the light!